Perfect for Halloween or any time you want to howl with laughter! It’s funny, it’s silly, and just a little bit scary. 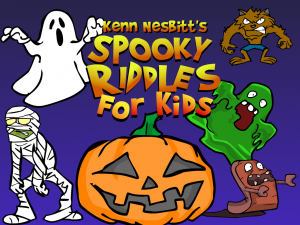 The funniest spooky kids riddles ever collected in one app. What kind of bees live in graveyards? Why did the Headless Horseman go to school? Why don’t witches wear baseball caps? Download this app and find out! On each eerily illustrated riddle, simply swipe the screen to reveal the answer. Click the star to bookmark your favorites. And turn on the haunting music and creepy sound effects for even more fun! Perfect for reading in the car on road trips, or any time at all. Learn a new riddle to make your friends laugh. What are you waiting for? Download now for just $0.99 and start laughing!